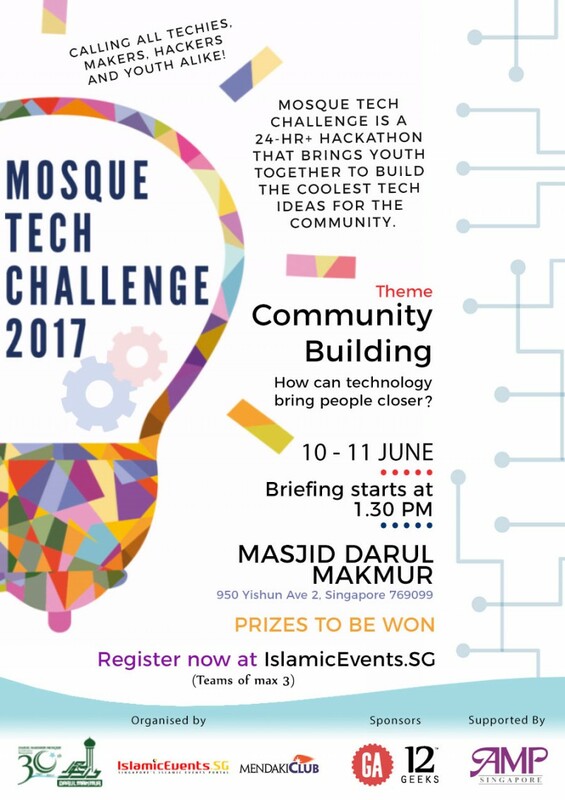 Registration has officially closed, however do contact fazli@islamicevents.sg or call 91798353 if you are interested in taking part. 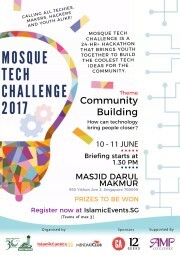 Mosque Tech Challenge is a 24hr+ Hackathon Competition that aims to give youths a platform to seek, implement and share the best and coolest ideas with technology towards the benefit of the community. We will be planning workshops leading up to the hackathon to introduce participants to some tools, and hence in the process of thinking about ideas, build our capacity for the skills and knowledge required - for the future. These workshops will be open to those who are not taking part too and will be free. We are looking for participants 16 years old and above in groups of maximum 3. Over $1500 in Cash and Voucher Prizes to be won for the top 3 teams and door gifts for each team. Generously sponsored by Mendaki Club, General Assembly and 12Geeks - and also an anonymous sponsor. - How much of the solution has been built in the 24 Hours. - Has the idea been implemented before? - Is it solving the problem in a different way? Contact fazli@islamicevents.sg or call 91798353 for any enquiries.